This is pathetic. Motorola and HTC, with their circus vixen's arsenal of makeup slathered over Google's native UI, ought to be ashamed. 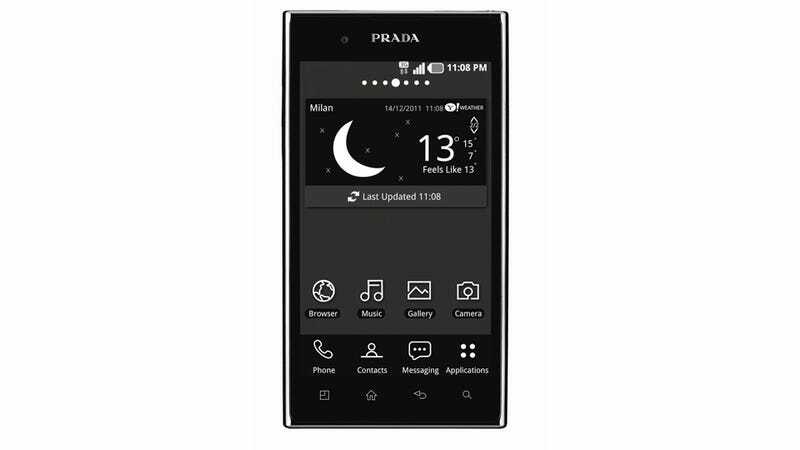 This idiotic LG/Prada luxury phone that nobody will buy has one thing going for it: it looks nice. The hardware is nothing special—black rectangle, tacky branded back, gloss, etc. A phone made for dummies who trade money for objects solely because of certain words robotically stamped on the casing. A plastic wink from a sad model on amphetamines. But the skinned version of Gingerbread underneath eschews all the aesthetic horrors, the orgiastic widget-dom of MOTOBLUR and Sense. Prada (or whoever cooked it up on its behalf) actually brings something Android has never shown as an OS: taste. Rather than looking like a crate of Duplo blocks turned upside-down, the elegant monochrome theme is restrained, clean, and beautiful. It's coherent, as if someone thought the whole thing through. No visual tricks, no eye candy, no animated swirls and koi pond splashes. It's designed. Sadly, it's trapped on a newly debuted phone with crap specs tied to a fatuous marketing tie-in. The oil barons that will own this won't appreciate the rarity of its sophisticated menus. I only hope someone at LG realizes they have an Android phone skinned wonderfully, and let that proliferate like a million knockoff Prada bags.